People who are friends with me on Facebook will know that one of the things preoccupying my thoughts at the moment is the introduction of a 1:1 iPad ratio at my childrens' primary school. We have had classroom iPads for a year or so now, and we also have laptops and desk tops in the classroom, so introducing 1:1 iPads is probably the next logical step in the IT progress of our school - and many schools in Melbourne. The difference this time is that parents are expected to pay for these devices themselves. We have a choice of hiring the iPads at $80 a term - or $320 per calendar year, or we can purchase an iPad of our child outright (a 16GB Wifi iPad retails for $449 at the app store, though I have seen sales of them around the $399 mark). We can also do neither and then our children will share a classroom iPad with any other children who also do not have their own iPad. It has been suggested that siblings can share one iPad - we have not had it explained how this would work with siblings who are in different areas of the school - perhaps a roster of days? Putting aside the concern about increased exposure to screen time (we've been told they will only use the iPad, on average 20% of the time, or about an hour a day all up), I have several concerns about this new move. On the 13th of November our politicians will vote on whether or not to scrap the school kids bonus. It seems likely at this point that the bonus will be scrapped. For my family, this means we will lose the potential of $2460 in assistance for the purchase (and hire) of educational costs. At the same time we will be expected to pay a minimum of $2690 for the cost of 2 x iPad hire + 2 x laptop hire + 2 x $285 curriculum and services fees in primary school + 2 x $350 school fees in high school + 1 bare minimum high school uniform. Free public education is not free. HELLO? Is that supposed to be reassuring? Are you telling me our teachers are not fully engaged in teaching? I'll tell you that that may be the reason the children are not fully engaged. Do Chinese kids all have iPads in China? Do Indian kids or African kids use iPads? I guess that is why they don't have any doctors or lawyers or teachers or business people in China, India, and Africa? Yes, I'm being facetious. 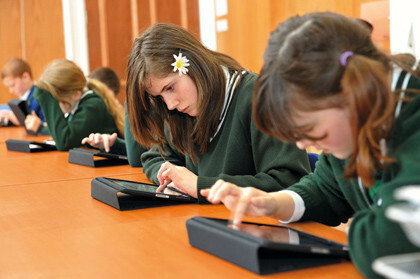 The school is pretty much saying the iPads will save Australia's lagging literacy and numeracy rates, yes? Um, no, but then again, my doctor doesn't expect me to buy the technologies she uses. I don't have to buy her computer or her blood pressure machine for her. Sure she may pass on those costs to me in appointment fees, but guess what, I don't pay out of pocket for those fees either - Medicare covers that because I'm on a ridiculously low income. I am medically not discriminated against because I don't earn over 100K. I have yet to see how each child having their own iPad will improve their education and allow them to do things they could not have done with pencil and paper or their imaginations (someone think of the imaginations of these children!). This is a lot of EXPENSIVE smoke and mirrors! I tell you a tool that should be used and taught the use of in schools.